It feels like Gina Rodriguez is stuck as a TV star. Most know Rodriguez as the lead of the CW show, Jane The Virgin, in the title role. It feels like Rodriguez just can’t break through onto the big screen. Now we have Miss Bala, a remake of the 2011 Spanish language film that puts Gina in the forefront. Rodriguez plays Gloria, a young makeup artist from Los Angeles that goes to visit her best friend Suzu (Cristina Rodlo) in Tijuana. Their plan is to have Gloria do Suzu’s make up for a beauty pageant and the night before they go out on the town to meet some of the judges to get a good look into the pageant. All that goes completely left when the club they are in gets attacked by a local cartel. Gloria loses Suzu in the chaos and ends up caught and indentured to the cartel. This puts Gloria in constant danger with the cartel boss Lino (Ismael Cruz Córdova) forcing her to commit crimes while the DEA is also pressing her to cooperate with them, all while trying to find Suzu. Miss Bala is a delightfully entertaining. It really isn’t that good but at the same time is kinda dope. It’s like a fresh hot Dominoes Pizza or something, it’s not great but at that moment it’s satisfying. Miss Bala is under two hours but somehow feels longer but not dragging, the pacing of the story is like magic how it stretches and speeds up at the same time. We see Gloria go through what feels like a month of adventure that is really only a few days . Most of this is held together by the performances. Rodriguez does a lot of the work here playing Gloria as constantly worried and hurried, you see a lot of it in her eyes and expressions. She never feels like a damsel in distress but you can feel that she's still in over her head. Córdova does a ton of heavy lifting as Lino, the crime boss/kinda love interest where he plays a super macho man that also has this vulnerability, like he doesn’t want to be a cold heart killer but you can never totally believe him. They have great chemistry on screen. 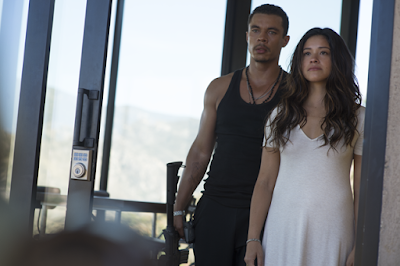 Miss Bala comes across like a mix of a genre fiction/exploitation movie and a telenovela, like a Ben and Jerry's ice cream concoction of a movie. It’s something that might not ever be high cinema but it is some of the best comfort food I’ve had in the theater in a while. Almost a hood classic, this movie is a good time. Some thrills, tense scene, gangsta $#!t, and even some good action.